Today I'm sharing my summer reading list with you. I just love a good, juicy read during the warmer months don't you? My lovely editor/ kindred spirit, Trish Todd, knows my interests so well and sent me a goody box with some of Simon & Schuster's most interesting summer reads. From Susan Rebecca White, award-winning author of A Soft Place to Land and Bound South, comes a breathtaking story of three richly nuanced outcasts whose paths converge in a chic Manhattan café as they realize they must give up everything they thought they knew to find a home at last. Alice Stone is famous for the homemade southern cuisine she serves at Café Andres and her groundbreaking cookbook, but her past is a mystery to all who know her. Upon Alice’s retirement, Bobby Banks, a young gay man ostracized by his family in Georgia, sets out to revive the aging café with his new brand of southern cooking while he struggles with heartbreak like he’s never known. Seeking respite from the breakup of her marriage, wealthy divorcée Amelia Brighton finds solace in the company and food at Café Andres, until a family secret comes to light in the pages of Alice’s cookbook and threatens to upend her life. Filled with the luscious scenery and enchanting characters her fans adore, Santa Montefiore’s Summer House is an unforgettable story about family, forgiveness, and the power of love. I am kicking off a summer of book giveaways with Susan Rebecca White's A Place at the Table. 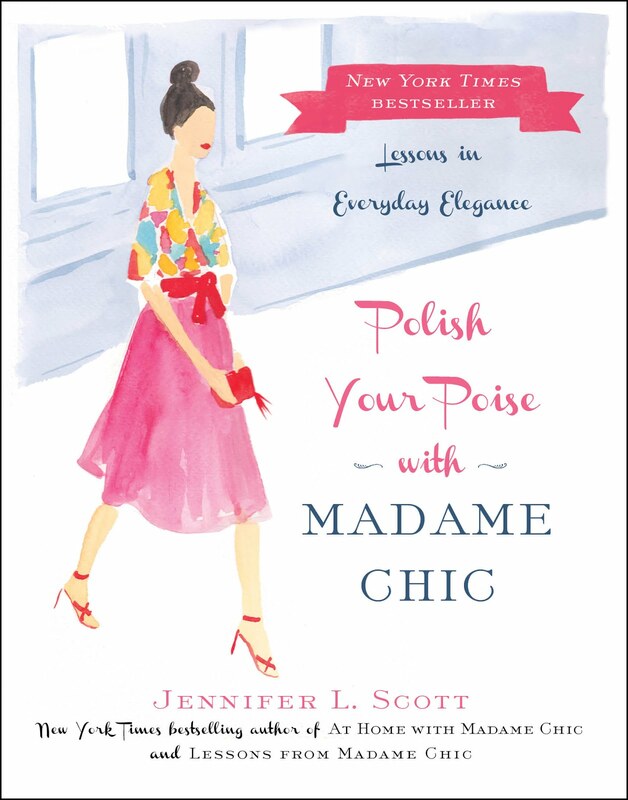 We are giving away 3 copies to readers of the Daily Connoisseur. The giveaway is open to U.S. residents only (terms set by Simon & Schuster). Please enter via the rafflecopter widget below. Best of luck! This week we are talking hair and nails. If you follow me on Twitter, Facebook or Instagram, you've noticed over the recent months that I've been having fun experimenting with braided hairstyles. I've always loved braids (it's the Madame Bohemienne in me!) so I was excited when Ulysses press recently sent me the new book by Abby Smith, The New Braiding Handbook. Abby Smith is a fellow YouTuber with a wonderful channel called Twist Me Pretty. This book is a valuable resource because while I usually just wing it and create a hit or miss hairstyle, The New Braiding Handbook gives you great step-by-step instruction on creating new and classic braided hairstyles. In this week's video I start off in pigtails (which is an age-inappropriate look for me!) but it's for a good reason... I give you a classic milkmaid braid updo tutorial half way through the video. The milkmaid braid might feel too costume-y for you but I think you should give it a try. You might surprise yourself with how chic you look and I think it makes a great (easy) formal updo as well. There's something very regal about it even though it is meant for the look of a milkmaid. Here are some of the braided looks I've shared on Instagram over the past few months. Which one is your favorite? And now let's talk about nails. I've been experimenting with various colors this spring, some of which are out of my comfort zone. I've found some beautiful ones! But I also realize that the neutrals and classics are still my favorite. These two in particular, Dior's Incognito and Rouge, are particularly divine. This week I would love to know... what are your thoughts on braided hairstyles? Would you ever wear one? What about nails? Do you like classic shades or do you prefer edgy colors? Do you do your manicures at home? Or do you have them professionally done? This week we are talking about clothing care: specifically delicates. I'm such a strong advocate for men and women dressing up on a daily basis. Many times people don't dress up because a.) they don't want to "ruin" their nice clothes and b.) they don't want to spend lots of money at the dry cleaner. Well, I'm here to help. Yes it is possible to wear nice clothes on a daily basis, prevent them from getting ruined and launder them at home. I know because that's what I do! All of those silk blouses and dresses in my ten-item wardrobe? I wash them at home and this week I'll share my secrets with you. Of course, I would like you to use discretion and common sense when deciding on how to care for a garment. Don't go sticking your prom dress in the washing machine! I don't wash all of my clothes... some of the more formal dresses I have always go to the dry cleaner. I'm talking about those everyday clothes, flowy tops, summer dresses, etc. Mesh laundry bags are wonderful and I think everyone with a washing machine should own them. They prevent your clothes from getting stretched and ruined by getting caught on the column during the spin cycle. They are also the only way to wash your undergarments when using a machine. It's important to pick the right detergent for the type of clothes you're washing. Delicate wash for delicates and wool and cashmere shampoo for sweaters. But no need to get carried away. You'll be surprised to know that I wash many of my clothes (even silks) with good old fashioned Tide. When washing delicate clothes it's important to avoid the tumble dryer at all costs. It will shrink your nice clothing, so I always hang my wet laundry on drying racks and iron them once dry. When you iron your clothes, make sure your iron is set to the proper setting (silks will be a different setting than linen, for example). Keep a good stain remover on hand. They even make travel sized stain removers for your purse (although I haven't quite got it together yet to purchase one of those). Take care of stains as soon as possible so they don't set in. Of course the best way to deal with stains is to prevent them entirely and I like to do that by wearing aprons whenever I am doing housework that could compromise my clothes. I love aprons and think they are a chic addition to any outfit when at home. This pretty Cath Kidston apron was a gift from my mother-in-law, Jane. Thank you! This week I would love to know... how do you take care of your clothes? Do you have any tips and tricks for us? What do you think of these methods? Are you more likely to wear your nice clothes around the house now? 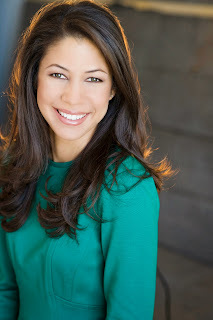 I have two treats in store for you on this special Thursday post on the Daily Connoisseur. First is the video tutorial for my Maca Latte, which is set to Mozart's Marriage of Figaro and just might be the most dramatic drink tutorial on all of YouTube! Second is the Wink & Winn gift card giveaway, which I know many of you are excited about. Maca powder is a Peruvian superfood. It is is a root that grows in the Andes mountains. The Peruvians have used maca for its medicinal properties for hundreds of years. Packed with vitamins and minerals, maca is known as a natural stimulant-free energy booster. It benefits the skin and particularly women's health and mood. You can read more about maca here at VegKitchen. If you don't have health food store near your home, Amazon have a variety of maca powders on sale at discounted prices. Check out their list here. Heat one cup of almond milk and a splash of soy creamer (to taste) in a saucepan while stirring constantly. Pour half of the milk mixture into a cup. Place the maca powder in cup and pour the rest of the milk mixture on top. Using a frother, mix well (around 30 seconds) to prevent the maca from clumping up. Sprinkle raw cacao powder on top. Serve and enjoy! This recipe makes one serving. Double it up for two. **Have fun making different variations: add a spoonful of Nutella for a hazelnut latte, put in a teaspoon of flax seed powder if desired, add more cacao powder for a mocha latte. 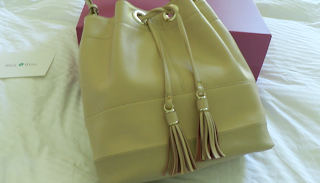 A while back I posted a review and tutorial for Wink & Winn's custom handbag service. Wink & Winn have kindly offered to give a $200 gift certificate to a reader of the Daily Connoisseur! Please enter the giveaway via the rafflecopter widget below. The winner will be announced on the widget one week from today and will be contacted personally. The giveaway is open internationally so all may enter. Best of luck! Quality TV, Guilty Pleasures & Walking Out of a Movie? 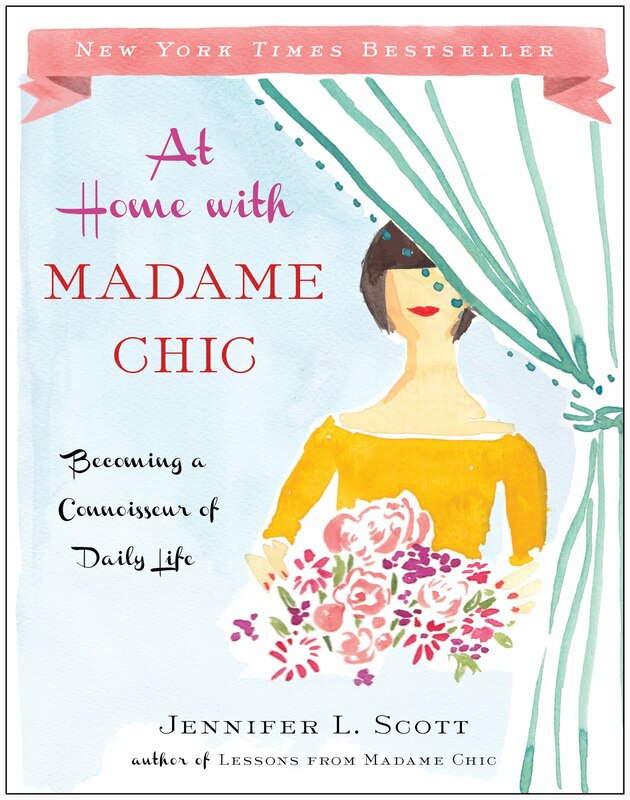 Thank you so much for your incredible response to my announcement last week about the new book, At Home With Madame Chic. So many of you preordered the book and sent over encouraging words. Thank you! And I agree with you... November could not come fast enough as I can't wait for you to read it. The week before last I had the honor of being the guest speaker for Lauren Evans and Susie Gilman's Happiness Series. 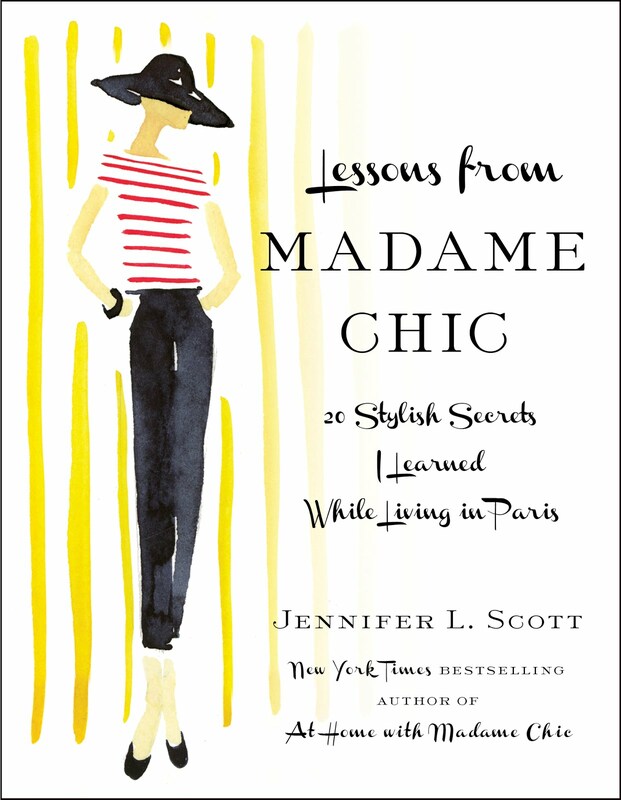 We gathered in the Pacific Palisades with 40 Madame Chic enthusiasts and had a lively Q&A discussion about how we can live the principles discussed in Lessons from Madame Chic and incorporate them into our lives outside of Paris. Everyone looked so fabulous! I especially loved the ladies in the Breton striped shirts! I wore a springy DVF cocktail dress and a turquoise necklace from Bauble Bar. Ten-Item Wardrobe-wise, cocktail dresses are considered extras because you only wear them on special occasions. Remember the ten core items of your wardrobe are clothes that you wear every day. It's important to have clothes for dressier occasions (church, parties, weddings, baby and bridal showers, etc.) It's a good idea to have a capsule collection of dressy occasion appropriate clothing that you can pull from when you have a special event. I can devote a whole blog post and video to this topic if you'd like. Let me know! Thank you again to Ms. Evans and Ms. Gilman for hosting such a lovely event. Always use the best things you have. I love this scene from a recent episode of Mr. Selfridge (which is one of the quality shows discussed in this week's video) in which the family use a beautiful set of dishes for their weekday breakfast. Using nice dishes on a daily basis feels decadent and can add a touch of elegance and ritual to your average morning routine. This week I would love to know... what are your thoughts on the programs discussed in this week's video? Do you have any quality TV or movies to recommend? What about guilty pleasures? Have you ever walked out of a movie?